This massive750,000 square feetbut attractive building, designed by Albert Kahn, was started the same year he completed the General Motors Building on West Grand Boulevard. You will see some similarities in these two large office buildings. Kahn had to use three side of an odd shaped block for the First National Building. His Vinton Buildingcompleted in 1917stands on this same block. Kahn wanted to make the most efficient use of the structural frame while simultaneously maximizing the amount of natural light in the offices. 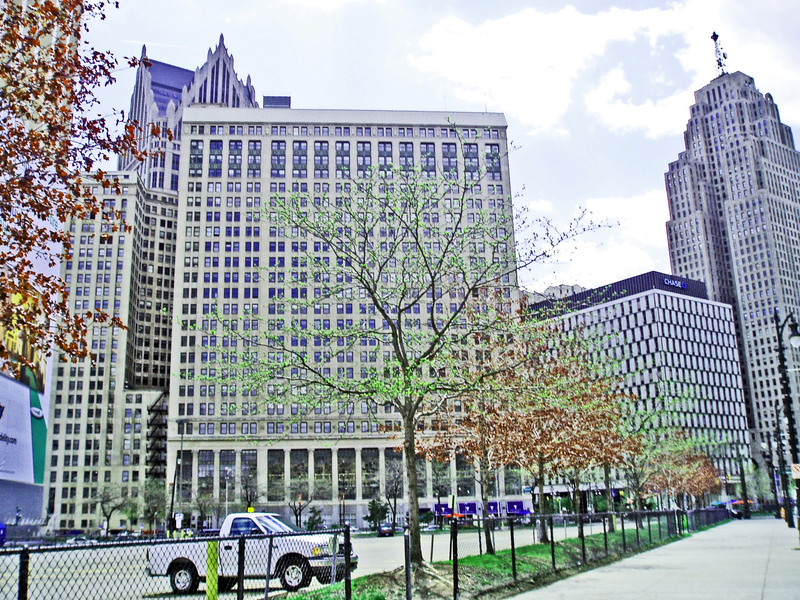 Perhaps to suggest the importance of this building and the stability of its occupants, he used classical colonnades with impressive windows along the Woodward side and the frontage on Campus Martius. Kahn took the idea of incorporating classical architecture very seriously, so the Corinthian pillars that you appreciate in this building were designed to resemble as closely as possible the columns of the Temple of Castor and Pollux in the Roman Forum. Presumably, the architects of the Forum never dreamed that their accomplishments and ideas would be borrowed nineteen centuries later and 8,000 miles away. Castor and Pollux—the twin sons of Zeus and Leda—were lesser deities in Greek mythology. They were gods of friendship, fertility and initiations and were presumed to be helpers and saviors of men who protected men from evil. You might also note the many decorative embellishments that Kahn added at the top of this 25-story building.